Headlines: Fishing has been very, very good this week and the Trout Festival is in full swing. 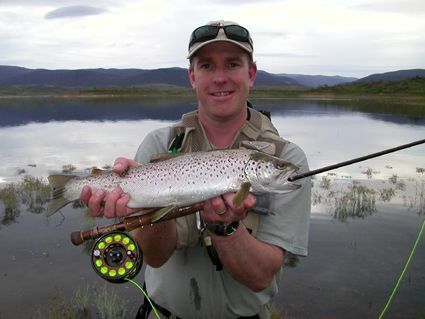 Some very nice Brown's have been caught in Jindabyne and some good Rainbows in Eucumbene. Rivers are flowing well after recent rain and the fishing in the whole Snowy/Monaro has really started to fire. There has been some excellent dry fly fishing in the area. The Eucumbene river is still producing good numbers of Rainbows on Glo Bugs and Nymphs long with some better sized Browns. The lower section is still the best. The Murrumbidgee has had some huge hatches of Caddis and some Mayflies also and is a great option for some dry fly work. Many other streams are fishing well and with the onset of more warm weather this will continue to improve. *An unamed angler managed 32 fish in three days on Glo Bugs last week, while fishing the lower Eucumbene. That is great fishing. 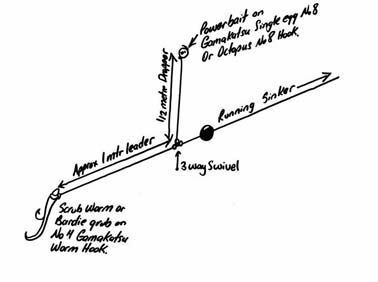 Seven gates has had fish moving in numbers on some evenings and a midge pupa or stick caddis will work well when fished with the slow dancing retrieve. *Managed a nice Brown from Jinde last week on an epoxy Midge pupa. As you can see there is some great flooded ground and this is producing big numbers of Midge. Fished the 27-29 of October with Rob,Mark, Bryce out of Rob Arthurs quinnie. We were pulling lures in close between Old Adaminiby and Anglers Reach we totalled 28 rainbows and 7 browns we dropped another 15+. The fish were small overall. Weather was great and the lures that did the trick was deceivers in black colours and gold minnows. CALF 16th Annual Fishing Competition: Buckenderra Holiday Village  Lake Eucumbene 26th  28th Oct. 2006. Fishing Report: Cobbitty Aids Leukaemia Funds 16th Annual trout fishing competition was held 26th to 28th October at Buckenderra, Lake Eucumbene. The event was held over three days from Friday to Sunday, with the dinner and auction held on the Saturday night. Some 71 people entered the competition with several there for the social aspect rather than serious fishing, never the less 42 anglers weighed in fish with 127 rainbow trout and 27 brown trout caught averaging 407grams clean weight. The largest Rainbow Trout caught was 578 grams cleaned caught by Manuel Cuevas. Largest Brown trout weighted 1305 grams cleaned caught by Barry Ward. The winner is judged on the best five fish for each angler, with 10 fish allowed to be weighed in over the three days per angler. This years competition winner was Manuel Cuevas with five fish weighed in at 3147 grams. This is the first time Manuel has won this competition which is an exceptional effort. Not only did he catch the largest Rainbow but he also caught the second largest brown weighing 1075 grams cleaned. These were both caught on bait and just over half of the fish on the weekend were caught on bait using Berkley Power bait or worms. Junior winner was Nicole Sandrone with five fish weighed in at 2896 grams which was second place over all. This years event raised over $7,500.00 for R.P.A Haematology Unit, Sydney for research and patient care.